a clear sign that we are at the “peak of inflected expectations” (to speak with Gartner’s hype cycle). 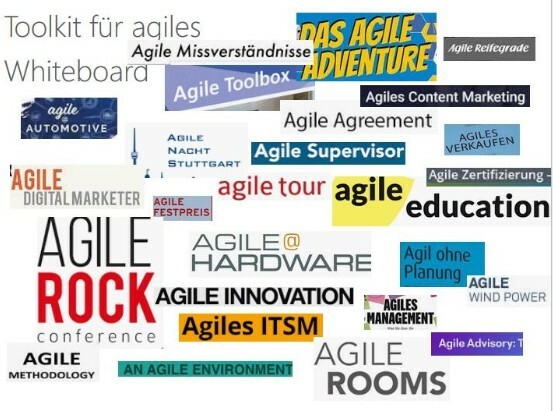 Everybody inventing a “new” agile approach refers to the Agile Manifesto as the fundament. But how can a Manifesto that has been created with the focus on software development for single solutions be a solid fundament for enterprise-wide agility? The simple answer: it can’t. What is missing? Values that are mandatory to scale Agile. 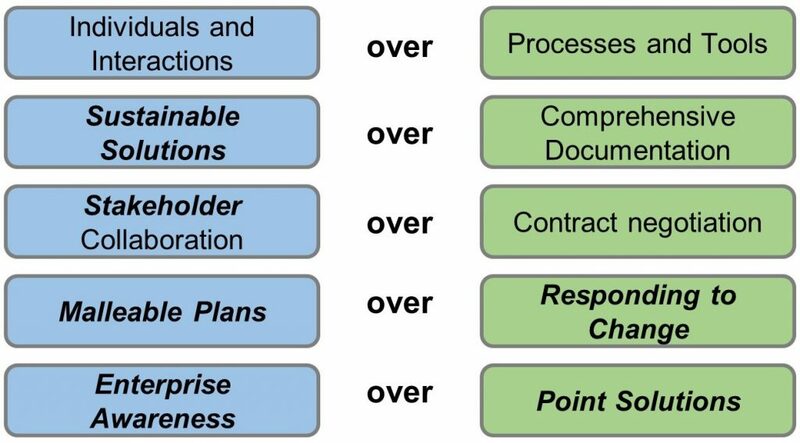 The existing agile manifesto is solution focused but not enterprise-aware. This might be one reason that emerging practices for scaling Agile (like SAFe@, LeSS, Nexus,…) and the “agile organization” are still immature, success stories rare. 1. Sustainable Solutions, not just software. Where the original manifesto focused on software development, a term which too many people have understood to mean only software development, DA suggests that we should focus on solution delivery. In short, we prefer solutions (software + hardware + supporting documentation + business process + organization structure) over just software. Solutions should be sustainable, which means that their business value is maximized from an enterprise-wide and long-term viewpoint. 2. Stakeholders, not just customers. Where the original manifesto focused on customers, we suggest that we focus on the full range of stakeholders instead. We prefer stakeholders – end users, operations people, sustainment people, audit, finance, and many more – over just customers. Last, but maybe most important: the enterprise as a whole must be treated as a customer. 3. Malleable Plans, not just responding to change. We agree that responding to change is mandatory in today’s volatile surroundings. But with General Dwight D. Eisenhower: “In preparing for battle, I have always found that plans are useless, but planning is indispensable” we believe that “malleable” plans are better than purely ad-hoc agility. 4. Enterprise-awareness over point solutions. We believe that following the current Agile Manifesto and its focus on the “end-user” blindly leads to point solutions that can be a catastrophe from an enterprise-wide viewpoint on the long-term. Business people should adopt an architectural thinking mindset and become aware of the dependencies with other business units. Lean business architecture models should be the basis for all strategic decisions.